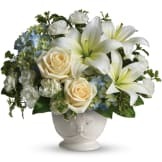 To offer comfort and consolation, these serene, softly colored roses and chrysanthemums are nestled in a round white basket with handle. 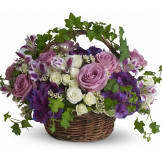 A satin ribbon is threaded throughout to complement the soft look. • Beautiful blooms such as white and light pink roses with white larkspur, white mums and silvery dusty miller. 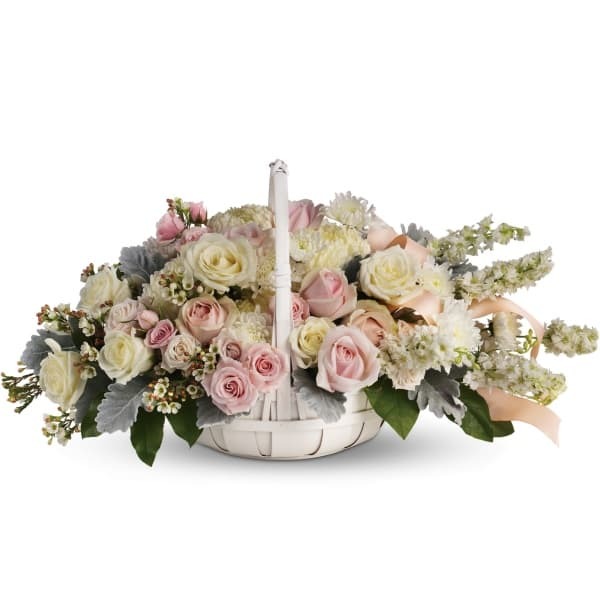 Arranged in a white handled basket and accented with satin ribbon. 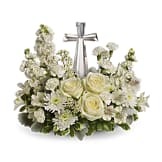 • This basket measures approximately 25" W X 12 1/2" H.
Flowers will be received by a Phillips-Robinson Funeral Home's staff.